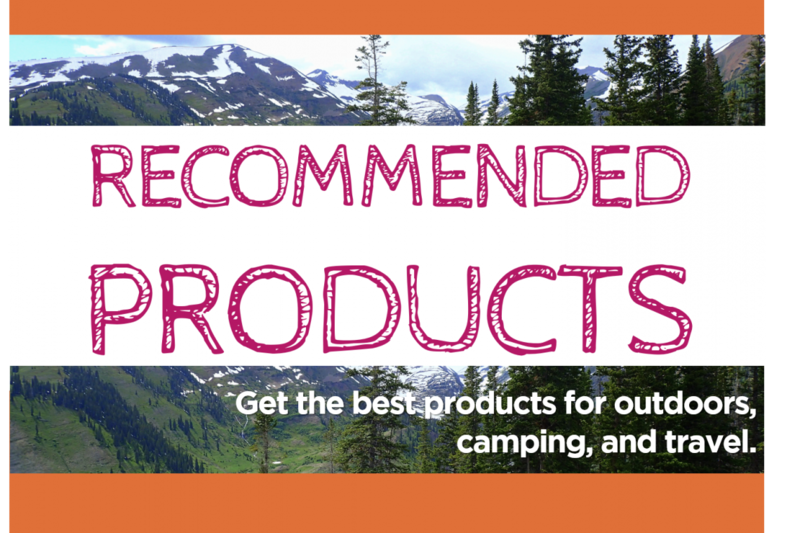 Check out all of my recommended products in one place! I know how it goes. You read a great blog, are ready to do some shopping, but loose that post with the product you are looking for. So then, you spend the next several hours searching for that article, only to not find it in the end. It’s annoying. Instead, I decided to make it easier for you and put all of my recommended products on one page. As a disclosure, I am using affiliated links and get a small profit when at no additional cost to you if you purchase through my link. You can read my whole disclosure here. However, this page in particular is devoted to my favorite products out there, and I will not recommend anything here that I do not use on my own and love. I hope that this can help you find the best gear for your next adventure. For the best night of sleep camping ever, pick up Big Agnes Hinman Sleeping Pad. Seriously, since adding this product, I have had no problems sleeping while camping. Not only does the padding feel great, this product is graded down to 15 degrees, keeping you warm through the night. If there is one camping item to invest in, this is it. Keep the party going all night. This speaker is solar-powered, weather-proofed, Bluetooth-ready, and equipped with a USB port to keep your phone charged. Even when other speakers have let us down, this one keeps going. This product is also light and compact so you can take it anywhere, even on a backpacking trip. Glam up your campsite. Add these twinkling lights to create ambiance to your outdoor adventure. These lights have a feature that coordinates with the music, leaving your guests in awe. I’ve had these for a few year now and love them! With a reliable solar power panel, this product never fails to excite. What better way to relax outdoors than in a hammock. Both me and my fiance Robb can comfortably fit in this bad boy. You can even sleep in there if you’d like. The days of spilling out of a hammock are over! I got this waterproof camera for my Belize adventure to capture one of the best coral reefs in the world. The photos were stunning. Olympus really nailed it with this rugged camera ready for your next adventure. I have this jacket in black and it is perfect for your crisp camping adventures. It keeps you warm without adding any weight. While it’s a bit light for winter weather, it does the job for the rest of the year. As a Denverite, people are always rocking their high end camping gear in the city. I feel like this jacket still looks good without looking like you are about to go on a hike. Yup. There is a reason everyone is obsessed with these. They are amazing. It is beautifully made with high quality material. Keep your water cold the whole day! I’m always surprised to see ice still in there after several hours. This also will not hold any flavors when putting other liquids in it. I’ve added red wine once and a simple wash will get rid of it 100%. Ah yes! The first of my wedding gifts have come in. These bad boys are amazing. Wind will no longer be a problem while camping. They are super heavy and handled the high desert winds of Goblin Valley without a problem. They also double as mugs so you can condense your camping box. If you don’t have packing cubes yet, get some now. They are a life save when it comes to backpacking and light traveling. These are great price and give you exactly what you need. I wore these babies while backpacking in Europe for two weeks and they rocked. The CloudStepper inserts gives the necessary support for someone like me with high arches even after walking 10 miles each day. It did feel like a cloud. These are lightweight and comfortable for any trip. Not only did my feet feel great, they looked super cute and went with everything. No longer do you need to sacrifice style for functionality. I still wear these out and about in Denver today.